. . . the kingdom of heaven is like unto treasure hid in a field; the which when a man hath found, he hideth, and for joy thereof goeth and selleth all that he hath, and buyeth that field. THE TRAIL TO TREASURE is exciting, difficult and filled with unexpected turns. It often catches us unaware and unprepared. But like the proverbial pearl of great price, a great discovery truly entices, enthralls, and repays us with interest: emotional and (over the years) financial. Here are current treasures in the cybervault at RICK GRUNDER - BOOKS . . .
Henry LEWIS' STUNNINGLY RARE PRINT OF THE NAUVOO TEMPLE, lithographed in Prussia, 1857. The only fine or colored original close-up illustration of the building published at the time, sketched seven weeks before the building was destroyed by fire. Click here - or on the picture - for a detailed illustrated description. ITEMS WHICH HAVE NOW SOLD APPEAR BELOW, listed here for general information and reference . . . THE "JULIA ALBUM" - The original photograph album of Joseph & Emma Smith's daughter. BOOK OF MORMON - always the most requested of the big-ticket items. 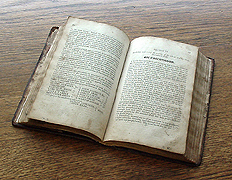 An original 1830 first-edition Book of Mormon. Flake 595; Howes S623; Grolier Club List of 100 Influential American Books; Sabin 83038; A Mormon Fifty, 1. Five thousand copies were printed on the third floor of the Grandin Building which stands on the north side of Main Street in Palmyra Village. Luther Howard, on the second story, saw to the binding, and by the end of March, 1830, sent copies down for sale in the walk-in store. Having thus descended from the Celestial level to that of earth, many copies were ultimately consigned to outer darkness. The few which stagger back from their extended missions find eager friends waiting, and are welcomed home as the collector's prize. A very good copy. Click here - or on the picture - to see a detailed illustrated description: Book of Mormon *PRICE NOTE: I sold this book for a friend who has done many business favors for me over the years. I therefore offered to sell this book for him but waive my usual commission fee (10%), thus reducing the actual price paid to $58,500. 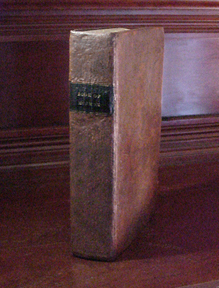 DOCTRINE AND COVENANTS, FIRST EDITION. Kirtland, Ohio, 1835. More rare than the Book of Mormon. Click here - or on the picture - for a detailed illustrated description. BOOK OF MORMON - Another original 1830 first-edition Book of Mormon. A particularly nice example, with the pages exceptionally clean and crisp. Original marbled calf. One of the two best examples I have ever sold. Owned by the same family in Vermont for a century before I obtained and sold it in 1996. Now sold again (2004). KINDERHOOK BROADSIDE - Ultra-rare Poster printed by John Taylor and Wilford Woodruff to prove the authenticity of the Book of Mormon. Nauvoo, Illinois, 1843.
::SOLD:: at Christie's, New York, in sale of Fine Printed Books & Manuscripts including Americana, 19 June 2007. GOVERNOR FORD TELLS ALL - Three exceptional 1840s records preserved in handsome leather folders. EMMA'S BOYS WRITE HOME. Touching communications from the three surviving SONS OF JOSEPH AND EMMA SMITH, to their mother. Mother I must tell you . . . I feel very sad and the tears run out of my eyes all the time and I dont know why. . . . strive as I will my heart sinks like lead. . . . I must tell someone my troubles . . . Obtained years ago through the Bidamon Family, with provenance. Poignant, illuminating, and finally for sale. Click here - or on the pictures - for a detailed illustrated description. CLASSICS from the personal library of LORENZO SNOW. Each with Lorenzo's rare signature. New York, 1880. Beautiful! And so rare . . . The ILIAD and the ODYSSEY, both published in New York, 1880, and evidently read carefully by the future President of the Church who had visited Grece only seven years earlier. Lorenzo was "Ever a student," even from his youth, recalled his sister Eliza Snow, ". . . his book was his constant companion . . . and when sought by his associates, [the explanation,] 'hid up with his book' became proverbial." Click here - or on the picture - to see a detailed illustrated description. THE HISTORY OF THE SAINTS ; Or, An Exposé of JOE SMITH And MORMONISM. By John C. Bennett. Boston., 1842. A classic and influential work in exceptional condition. Includes THE FIRST PUBLISHED PORTRAIT OF JOSEPH SMITH. Click here - or on the picture - for a detailed illustrated description. KIRTLAND BANKNOTE - the most ornate of early Mormon collectibles! A beautiful 1837 engraved $5 Mormon banknote. The Kirtland Safety Society Bank (Kirtland, Ohio). Original banknote (five-dollar bill) signed "J Smith Jr" [secretarial] and "S Rigdon." Accomplished in manuscript (filled out) and issued on February 10, 1837; manuscript serial number 742. 7½ X 17½ cm. (3 X 7 inches). A beautiful example, in very nice condition indeed. The paper is strong and clean. Click here - or on the picture - to see a detailed illustrated description. Over a quarter-century, an antiquarian bookseller accumulates a few memories! See some highlights among my TREASURES PAST. Picture at the top of this page: The Shangrila-like scene above is a daily retreat, overlooking the largest of three creeks on my property. 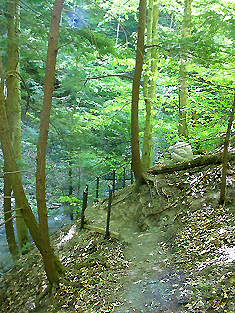 I hacked out the trail and drove the stakes beginning the day when the snow melted in April, 2001. My bones informed me that I am getting older, but it was certainly worth the effort!